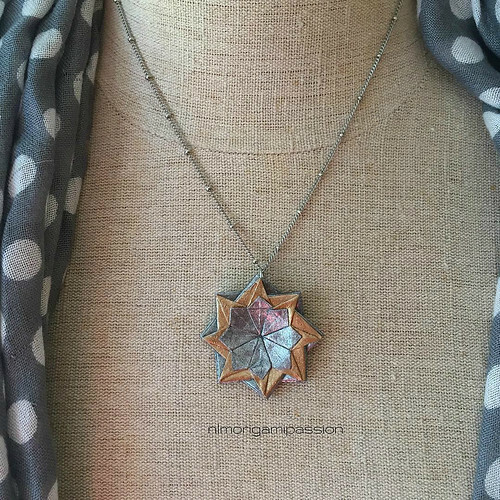 Few things make me happier in blogland than putting together a post about paper jewelry. Unique designs and pretty pictures are my cup of tea. While scouting around, I came across so many paper jewelry artisans who are doing great things, I've decided to break this post into two parts... next one coming soon. 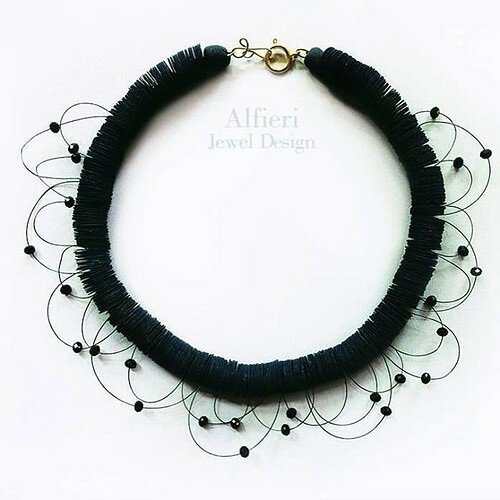 Alfieri Jewel Design in Milan, Italy created these first three contemporary examples. Verde works with a wide variety of materials in addition to paper... metals, pearls, natural stones, Swarovski crystals, and silk. Admittedly, it takes a dramatic person to carry off statement pieces like this disc and looped wire necklace or lacy collar with crystals. Verde fittingly describes the black one as 'stars in the universe'. 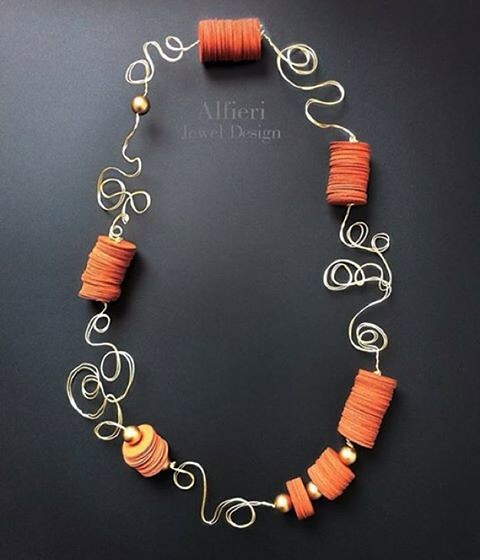 Alfieri Jewel Design is on Instagram. 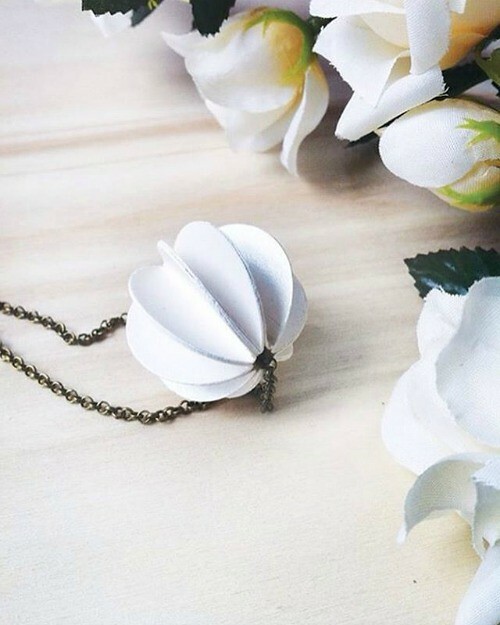 This origami necklace by Nicole Lopez Menendez [edit: no longer available] is almost demure in comparison, but it is equally pretty and unique. She folds beautiful papers, often with a metallic sheen, and sources special findings. 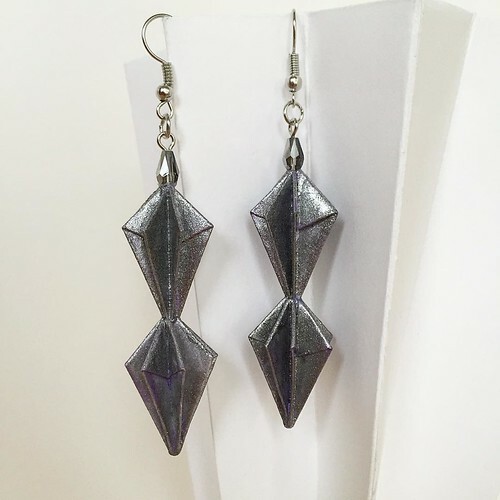 These silver triangle earrings are a bolder example of her work. You might remember Nicole from a previous feature about the remarkable paper flower arrangements she creates for NLM Origami Passion. Nicole welcomes custom orders at info@nlmorigamipassion.com. Kathy Tsangaridis is an Australian living in Germany. 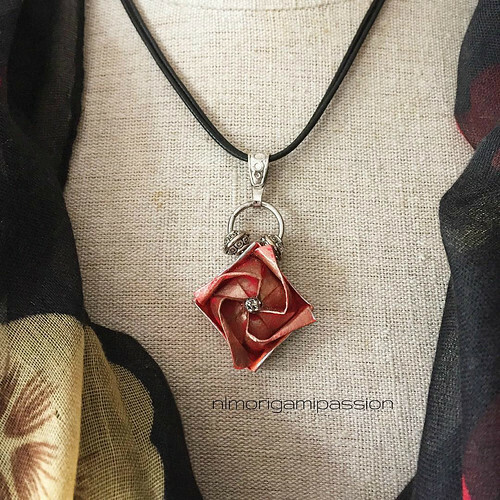 With a lifelong passion for making and a degree in fine arts, she recently began selling her creations via Etsy shop Papierfuchs Jewellery [edit: shop has closed]. 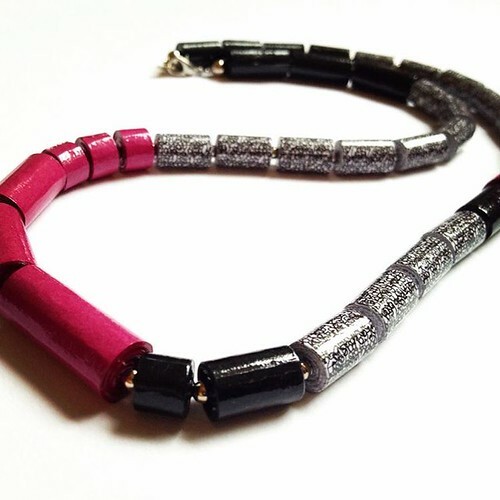 Her necklaces have a polished, streamlined look, and I think the combination of vivid, multi-size paper beads is eye-catching. 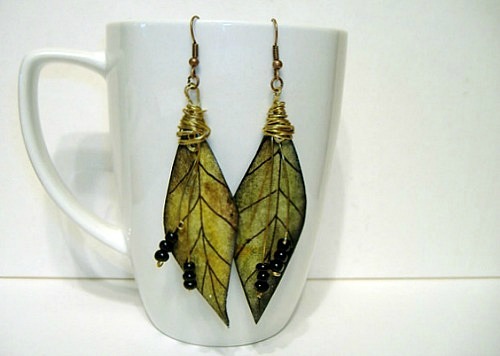 Kathy also makes cut paper and resin necklaces and earrings. 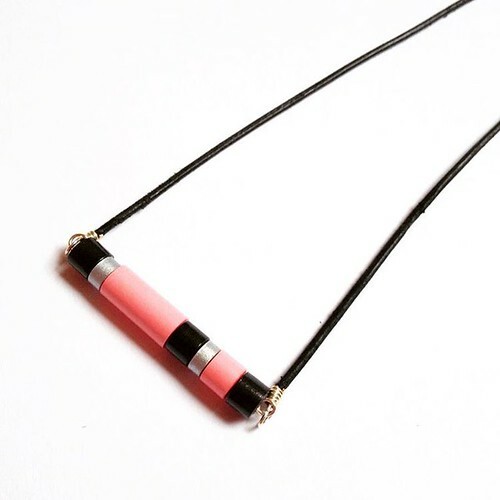 This glass-like pendant makes me think of a tuxedo jacket, and I love the way she has combined hot pink, black and patterned black/white papers (below) for a modern, asymmetric look. Papierfuchs Jewellery is on Instagram as @derpapierfuchs. 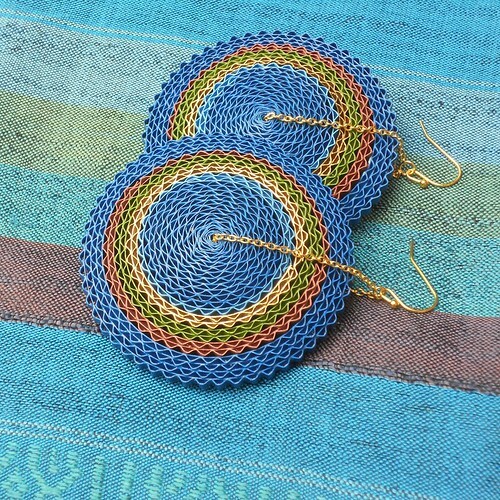 Lee Owenby hand paints paper that she uses to make one-of-a-kind earrings and necklaces. Sealant gives the paper a leather-like feel and makes it water resistant. 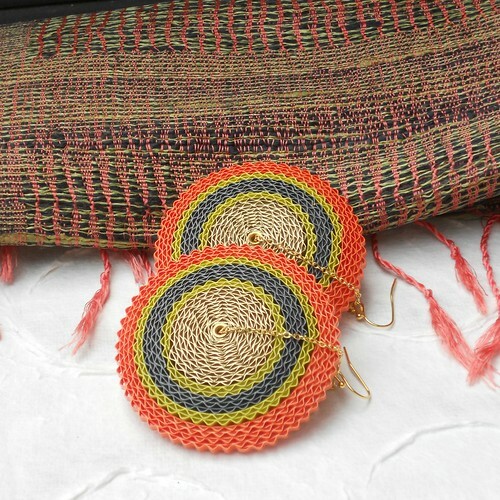 Her eclectic designs often include recycled paper and parts of upcycled jewelry, and sometimes clay and beads, repurposed vintage buttons, cloth, metal findings and other doodads. Such interesting combinations! 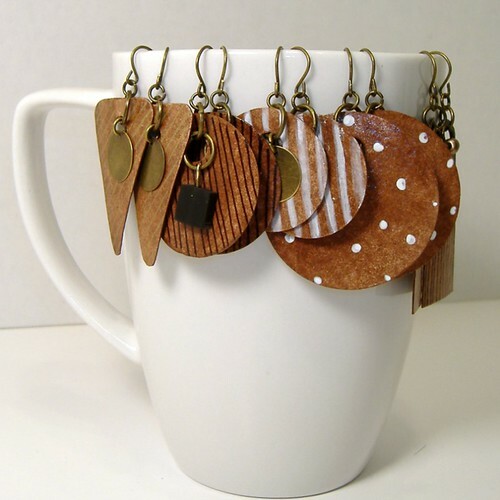 I told Lee the earrings above remind me of wood even though they are painted paper. 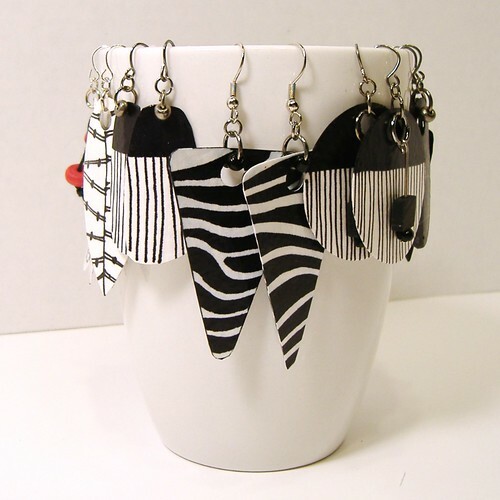 Her striking black and white earrings would surely attract attention! Lee's jewelry can be purchased at Herron & Wills in Paris, Tennessee. She is on Facebook as Artist Lee Owenby and can be contacted directly via her website, Lee Owenby, where she has a page of colorful jewelry samples. 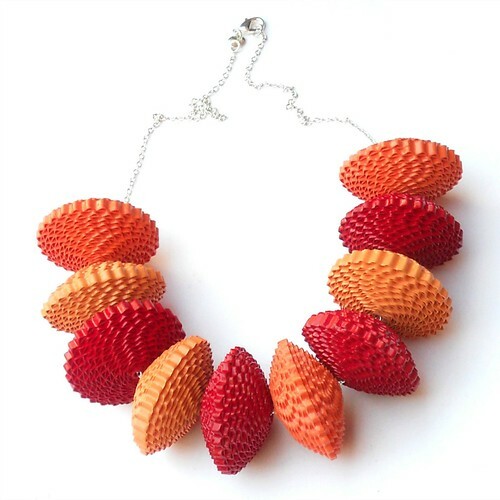 Hanga Mathe of Bablefish Jewelry in Philadelphia uses corrugated paper with silver and surgical steel components that result in solid, yet lightweight earrings and necklaces. Each piece receives a special enamel coating so it is splash-resistant. She has set up a 10% off coupon for All Things Paper readers that is in effect through March 31, 2016 at Etsy shop Babelfish Jewelry. Use code ALLTHINGSPAPERBLOG at checkout. 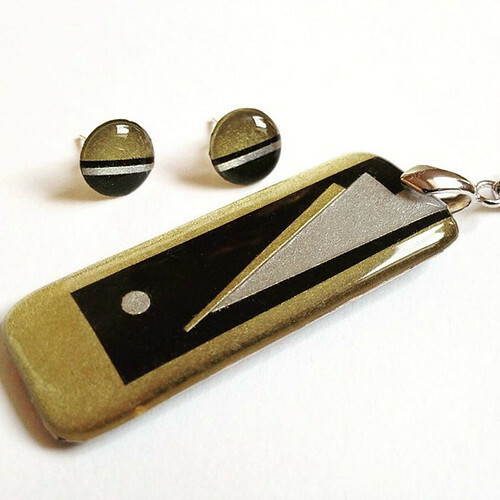 See her latest designs on Instagram where she is @babelfishjewelry. So there you have it... lots of ideas to liven up your spring wardrobe! By the way, Mother's Day is a bit early this year - May 8 - AND there will be an exciting paper jewelry giveaway coming up on Monday. All these pieces are so beautiful. I love the inspiration and creativity. So glad you enjoyed the post, HJ and Divya. I love creating with paper and re-cycled and up-cycled materials! Maybe one day I'll be known too!These are absolutely beautiful! afroniqabi01, I'm glad you enjoyed the post.